Along with the squat and the deadlift, the bench press is a basic foundation exercise that needs to be included in your routines. The bench press move targets nearly every muscle in the upper body except for the back. You’ll hit the shoulders, chest, triceps and biceps giving you a well-rounded work out. 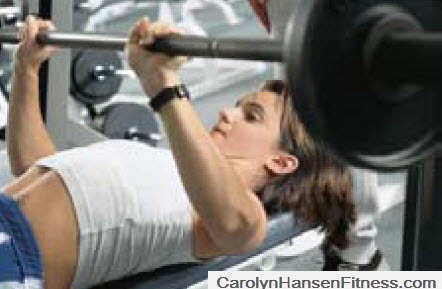 The bench press is the perfect move for providing serious upper body strength. It is typically performed using a bench press machine with a barbell or if you prefer working out at home or an alternate strategy, it can also be done using just a set of dumbbells. You can also perform the bench press on an incline or a decline (simply by adjusting the bench) which then works the upper or lower chest muscles to a slightly greater degree. The advantage to using dumbbells occasionally over barbells is that doing so makes each arm responsible for its own weight load. This way you can be sure that one arm isn’t overcompensating for the other. If one arm is stronger than the other the strong arm will end up doing the brunt work of pressing the barbell upward. Dumbbells require more muscle activity in order to maintain balance through the entire range of motion. Position yourself in a flat bench placing both feet down on the floor for support. Place your hands on the bar using an underhand grip…slightly wider than shoulder width apart. Press the weight upward extending the elbows as you lift it up off the bars. Think of keeping the abdominals tight as you do this so as to avoid excess strain on the lower back. Once the elbows are full extended slowly bend them as you lower the weight down to the body coming as low down as possible. Pause in this position and then press up again to complete the rep.
It’s important to remember when performing the chest press that you do come all the way down through the movement. Coming only half-way down means you only reap half the benefits. You need to lower all the way down so that the barbell is almost touching the chest. That way you are assured that you are working the muscles to full capacity. You can adjust your hand grip position as well by using a slightly wider grip pattern and working the outer edges of the chest to a larger degree or you can reverse your grip pattern, targeting the triceps more. Like any weight resistant exercise it’s important that you lift only as much weight as you can handle while still maintaining good form. Lifting weights of any kind demands that you listen to your body and the signals it is giving you if you want to avoid injury. Variety is the spice of life and this platitude applies to exercise as well. By adding variation to your exercise routines you help ensure that your body keeps guessing what’s coming next. The result is a stronger, fitter body. The bench press is just one of a few foundation movements you should be utilizing with your minimalist training. Most people today who exercise regularly, and who make conscious choices about the quality of the food they eat, are not getting anywhere near the degree of benefits from their actions that they could be getting. If you are one of those, my new “Minimalist Exercise and Nutrition” program can help.